Alrighty moms! 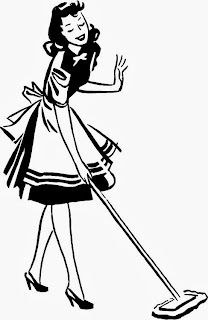 How many of us clean our house? (you don't have to raise your hand if you don't want to.) Do you know how many calories you are burning while cleaning your house? It is quite amazing actually to see that yes cleaning does burn calories. I hate cleaning. I hate having a dirty house even more so my dislike for cleaning is overruled. So I teach piano lessons out of my house 2 days a week which means that for those 2 days a week that 3/4 of my house actually have to be clean. The main living floor: foyer, 1/2 bath, kitchen and living room where I teach and the basement need to be cleaned (that is where all the family members hang out while I teach since there are lots of toys for siblings to play with down there). I don't do a deep clean every week but I vacuum every week sometimes more than just 1 time depending on how messy Mason has been that day. I just looked it up here a that if you weigh 165 lbs and vacuum for 60 min you have burned just shy of 200 calories. I know that doesn't seem like a lot compared to the gym and all but that is just vacuuming. Combine that with doing an in home walking DVD for 3+ miles and you are doing 500 cals a day alone in just a short amount of time. Need a little extra boost in cal burn. Run your stairs a few times too, try carrying your kid up the stairs a few times, or race them up it (as long as it is safe for you child). That will get you burning. These are all things we can do at home. Involve the kids. Make it fun. But don't stop moving! QOTD: What other activities can you do with your kids to exercise?